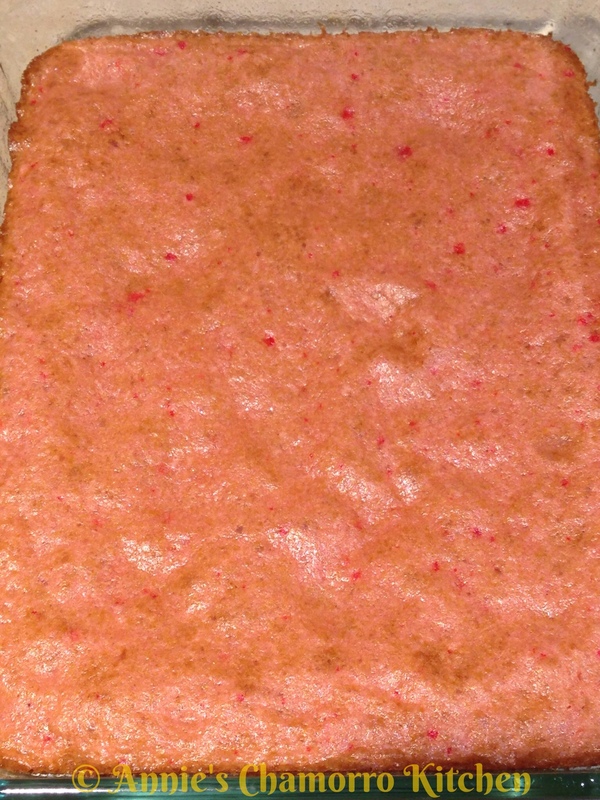 Guava Cake is a delicious Hawaiian dessert that is quickly becoming popular nationwide. 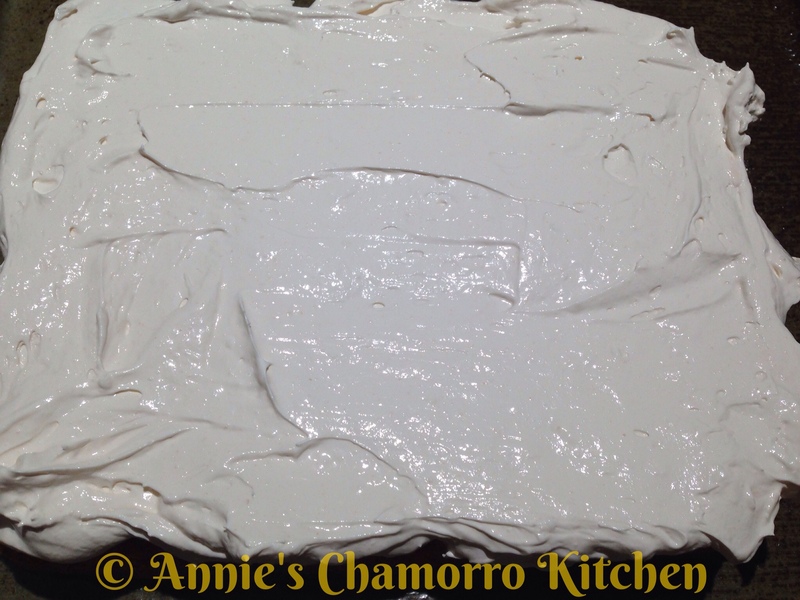 It’s traditionally made with chiffon cake, but my quick and easy recipe uses boxed cake mix. 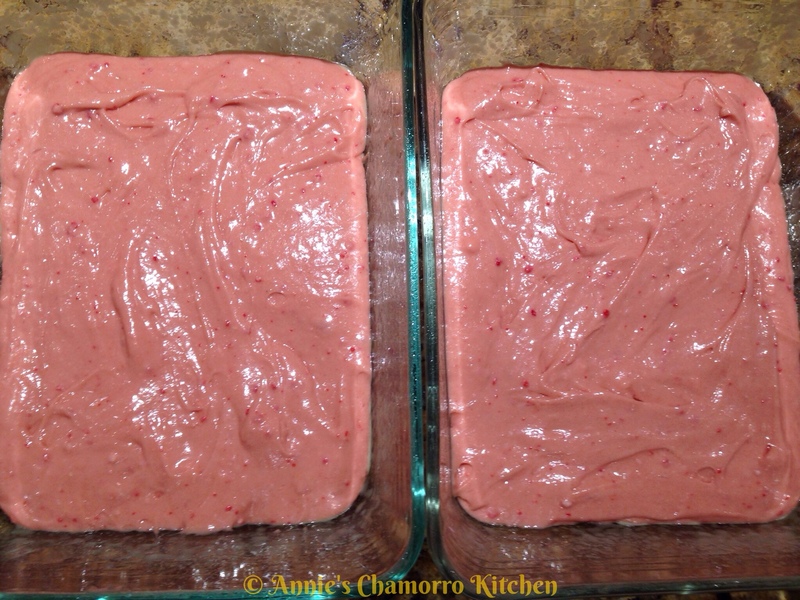 I like using strawberry cake mix for my recipe–it amps up the guava flavor in my opinion. 1. Prepare the Guava Juice. 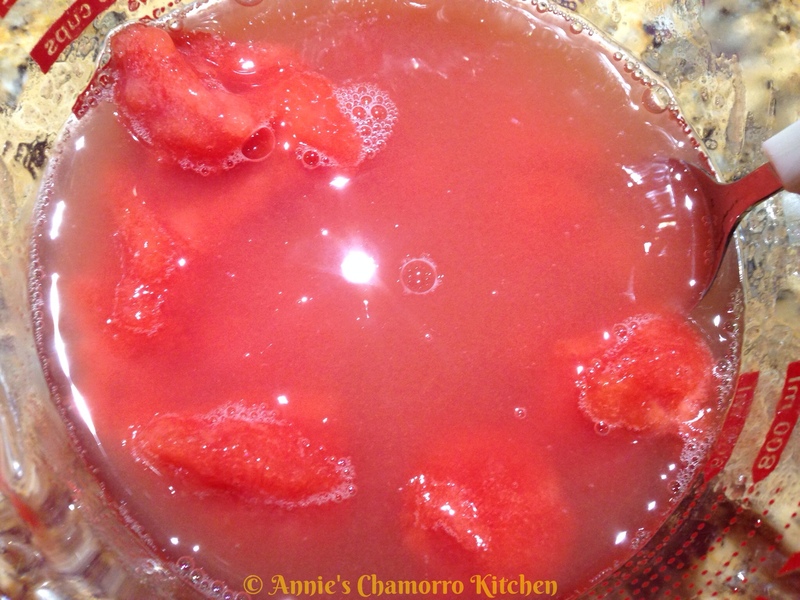 Empty the contents of the frozen concentrated guava nectar into a small bowl or measuring cup. Remove 2 teaspoons of the concentrated nectar and place into a small mixing bowl. Set this aside for now (you will use this when you make the frosting). Add 1 1/2 cups of water to the remaining frozen concentrated nectar. Stir until the frozen nectar completely dissolves/melts and combines with the water. You should have about 3 cups of juice. Set aside. Add the cream cheese to the mixing bowl with the reserved 2 teaspoons frozen concentrated guava nectar. Note: I had a jar of guava jam in the fridge; I also added a teaspoon of jam to the bowl, but this is totally optional. If you don’t have any guava jam, don’t worry about it. I just like to add it to the frosting to give it a guava flavor. 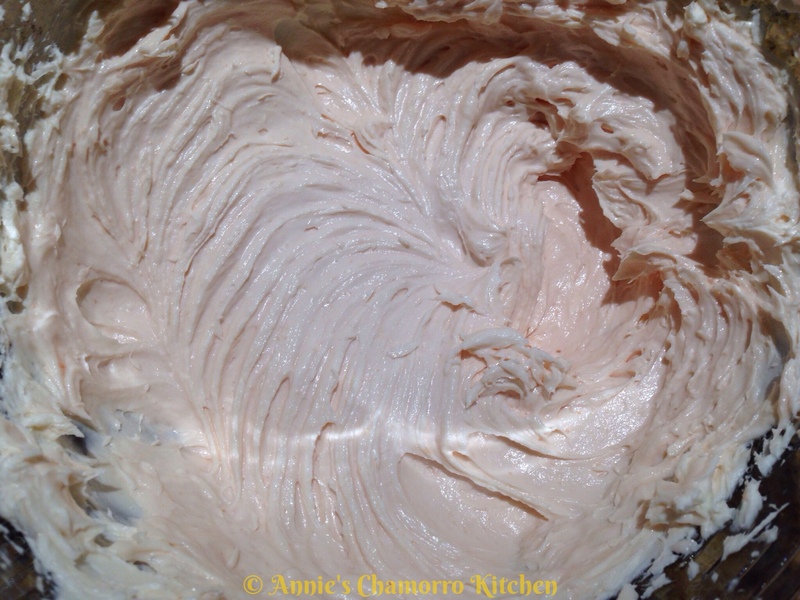 Using a hand mixer, mix the cream cheese and guava nectar until creamy. Add the Cool Whip to the mixing bowl. Mix until creamy. Place the frosting in the refrigerator until ready to use. Empty the contents of the cake mix into a mixing bowl. 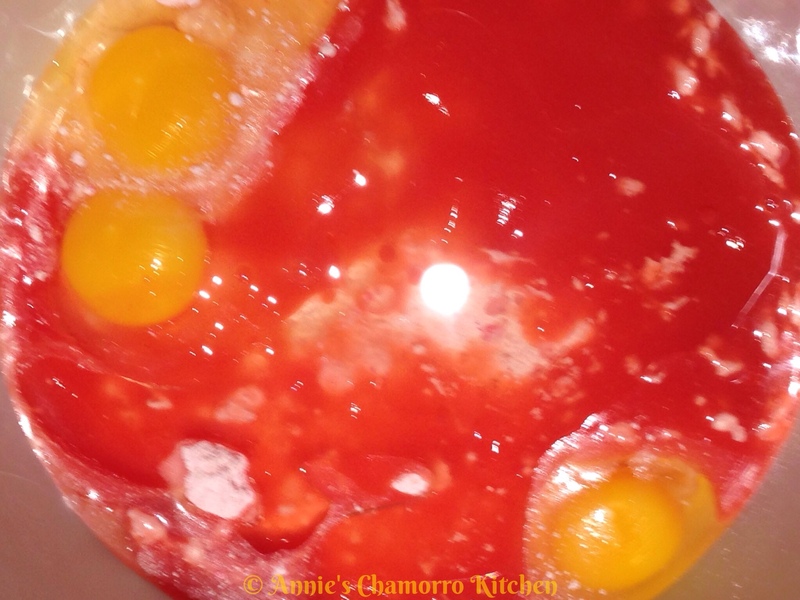 Into the bowl add the eggs, vegetable oil, and 1 cup of the guava juice (set the remaining juice aside–it will be used later to make the guava sauce). 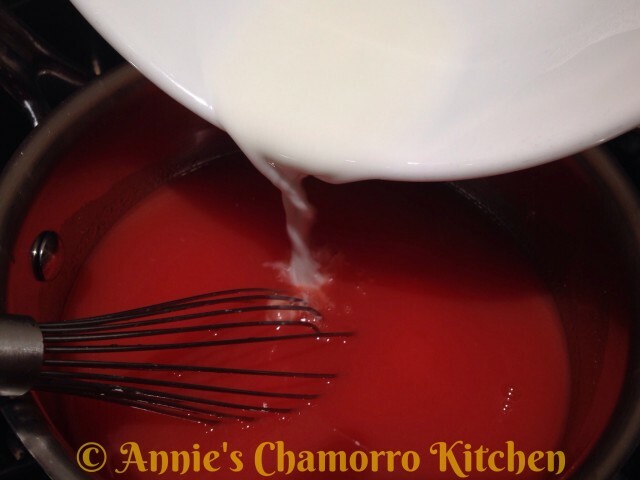 Using a whisk or mixing spoon, mix the ingredients together. Don’t over-mix the batter; mix only until the large lumps disappear. Split the batter between two small pans. Bake at 350 degrees for 25 minutes or until a toothpick inserted into the middle comes out clean. Let the cake cool completely (I inverted it onto a plate to finish cooling). 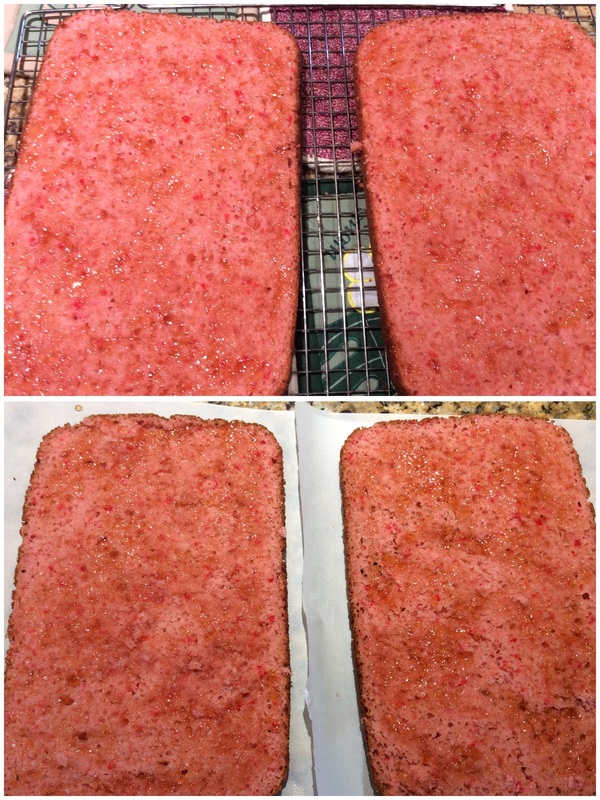 To give your guava cake a boost of guava flavor, split the cakes in half while still warm. Heat the jelly in a microwave-safe cup for one minute. 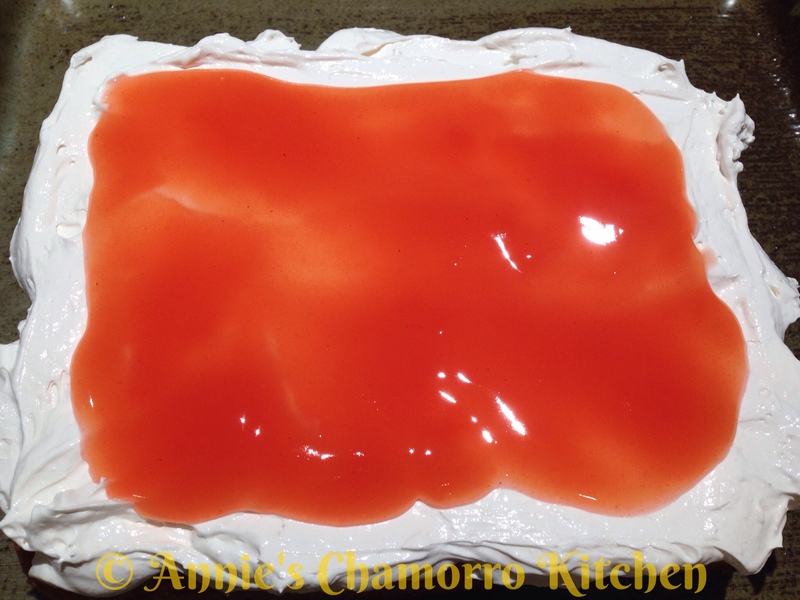 Spread the guava jelly over the top surface of each of the cake halves. Allow to cool then place the halves back together. Proceed with the remaining instructions. 4. Make the guava sauce. 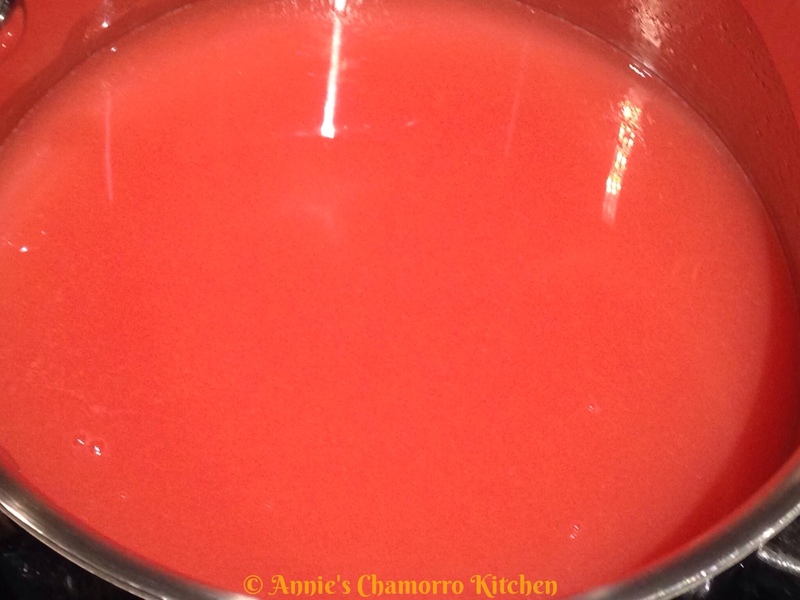 Place the remaining 2 cups of guava juice into a small saucepan. Turn the heat to medium high. 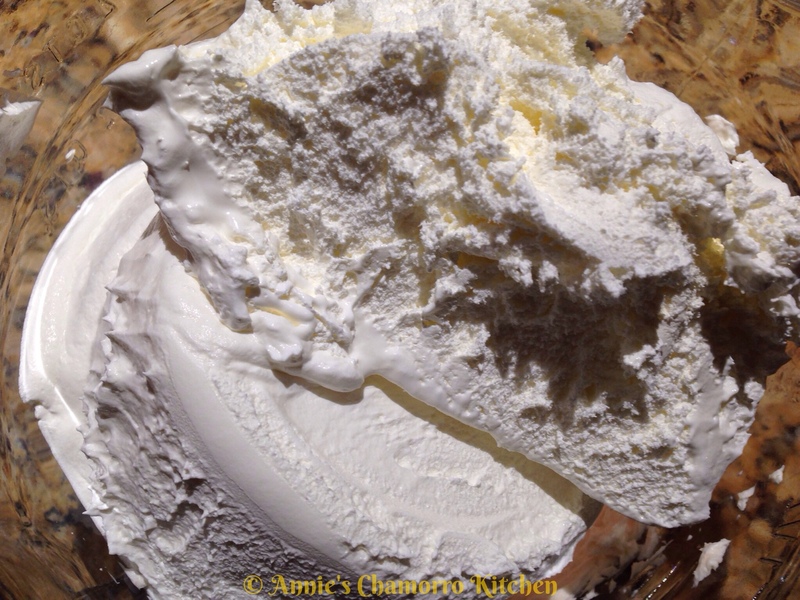 Mix the cornstarch with 4 tablespoons of water. 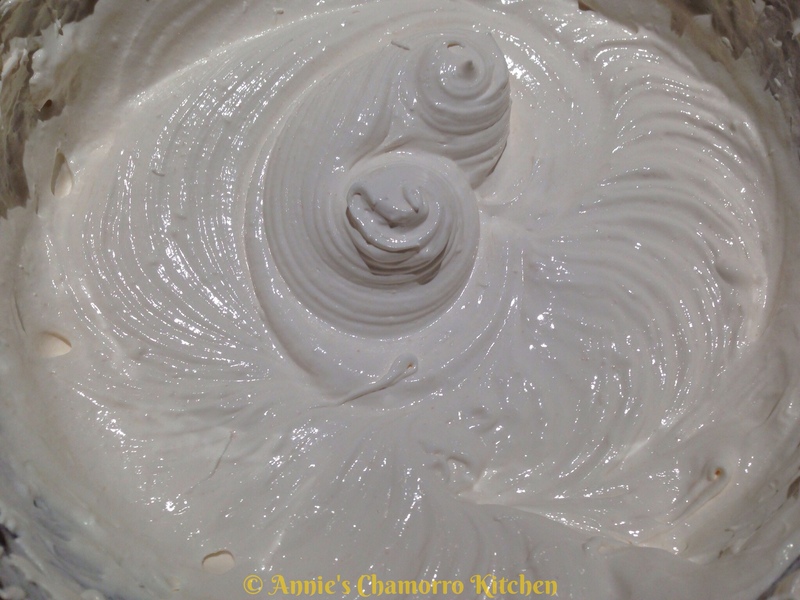 Pour the cornstarch mixture into the pan, mixing with a whisk. Continue whisking the mixture over medium high heat, cooking until the sauce begins to thicken. The sauce will thicken only after it comes to a boil. Once the mixture starts to boil, reduce the heat to medium low; continue cooking for a couple of minutes then remove from the heat. Pour the sauce into a small bowl or measuring cup. Refrigerate until ready to use. Note: Let the sauce cool completely before pouring onto the cake. Place one of the cake layers onto a serving plate. Spread a thin layer of frosting onto the cake. 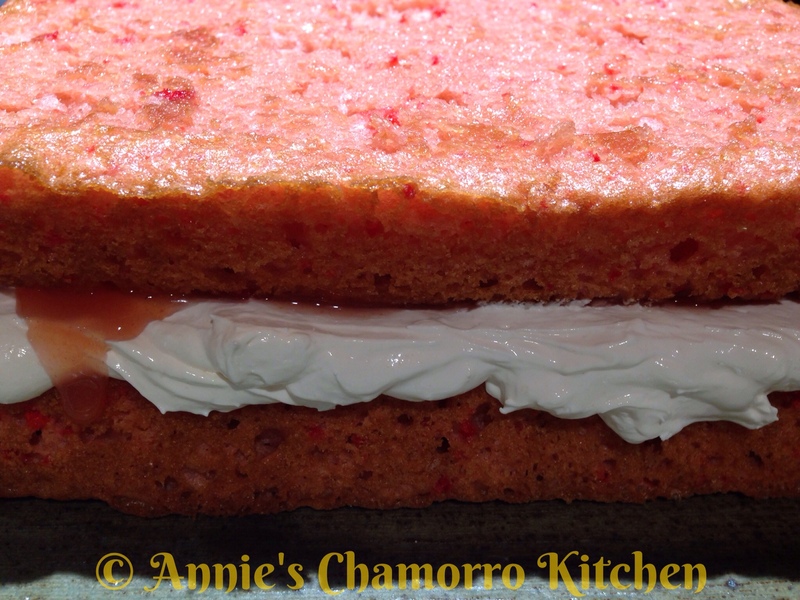 Spread some of the guava sauce on top of the frosting, staying about one inch from the edge. Place the second layer of cake on top of the first layer. Frost the cake (top and sides) with the remaining frosting. Pour the remaining sauce on top of the cake. If you have room in your fridge, refrigerate the cake until the sauce and frosting sets completely. If you have a cake decorating bag and tips, you can be fancy and pipe a border around the edge to keep the sauce nice and pretty in the middle of the cake. If you have any sauce left, pour some over the cake–man oh man–I want some more cake (I ate 3–yes 3–pieces). 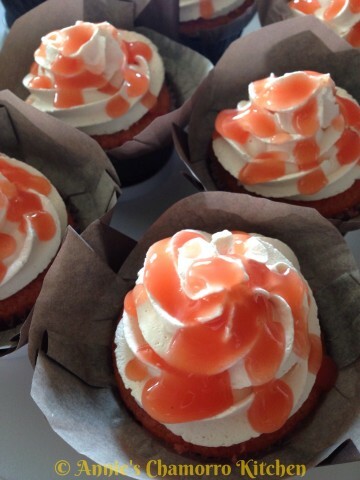 I also made some guava cupcakes. 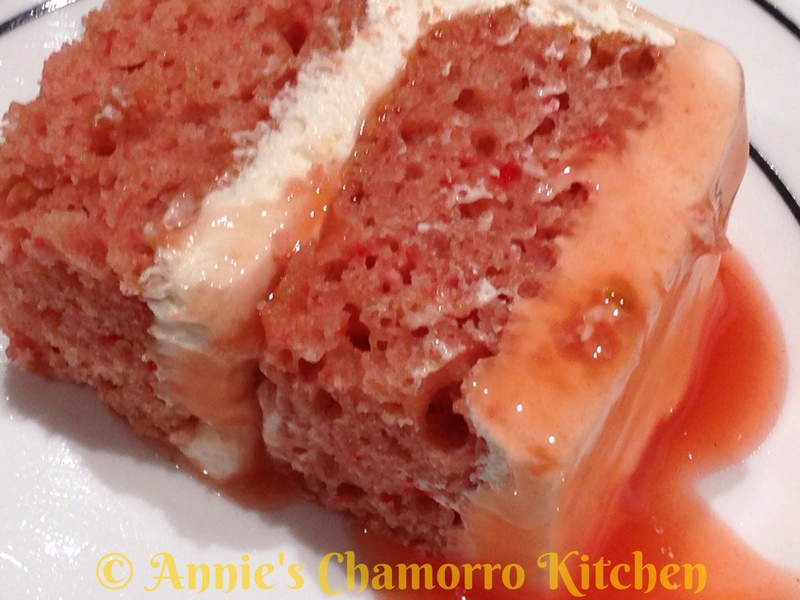 You can place some guava sauce in the middle (cut a piece of cake out of the top), top it with frosting, then drizzle more sauce on top. Do you have a recipe to make this without the box cake mix? i would like to make it from scratch. Hi Marie, no I don’t. Guava is a favorite of mine. I used to eat fresh guavas all the time growing up. Let me know how your cake turns out. I’ve made this twice and I love it and so do my kids !! 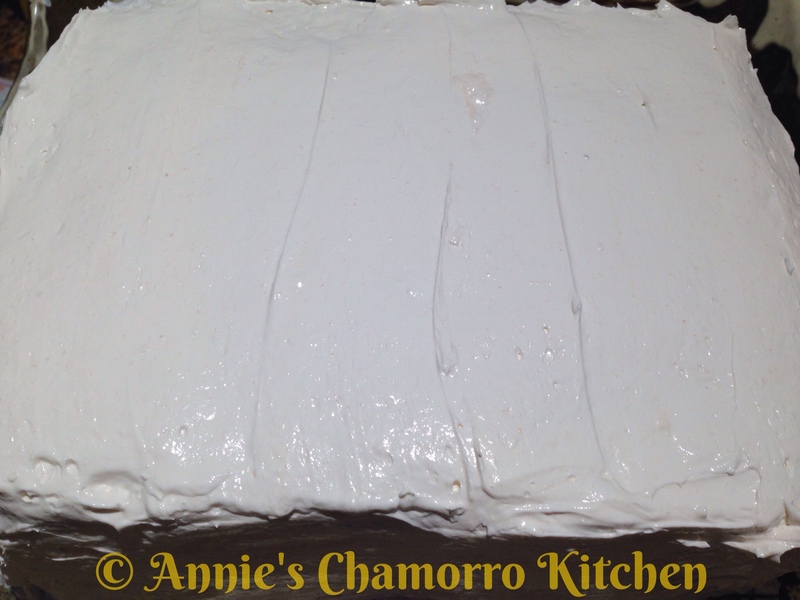 It’s in the favorite dessert recipe box….and I’m making it again today for New Years Gathering. I decorate it with sprinkles etc. Rhank you for sharing recipe!! Sorry, I meant Thank You…Happy New Years ! Oh man! This cake was a hit!!! I’m not Chamorro, and i try to cook Chamorro dishes for my husband and daughter, so I was especially proud to see how much they loved this!!! Baking it today for my island giri. Your recipe seems pretty straightforward. I’ll check back in afterwards. Hi Sonia! 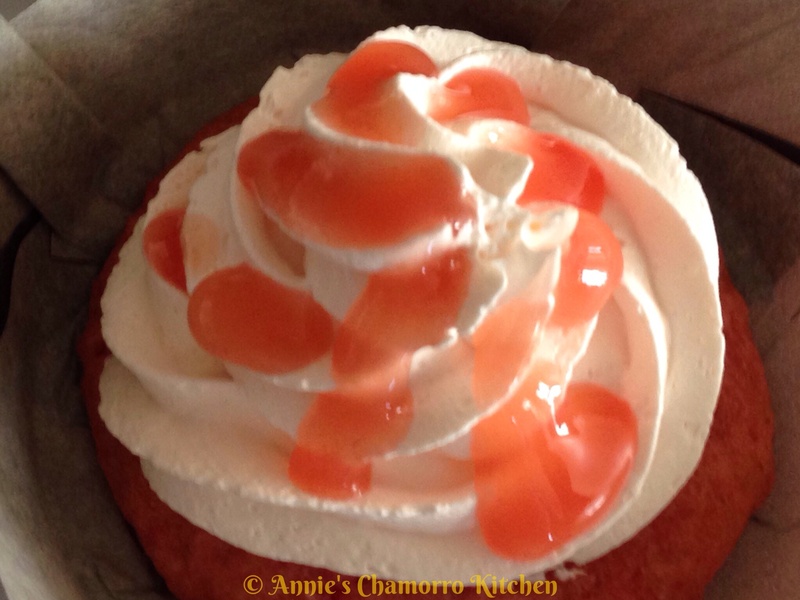 How’d your guava cake turn out? I’m on my 3rd guava cake. My husband wants me to make another one for his coworkers for Easter. Your recipe has been such a hit! My husband wants me to make another one for his guys on fathers day! Thanks again for being so generously sharing your recipes. You’re very welcome! 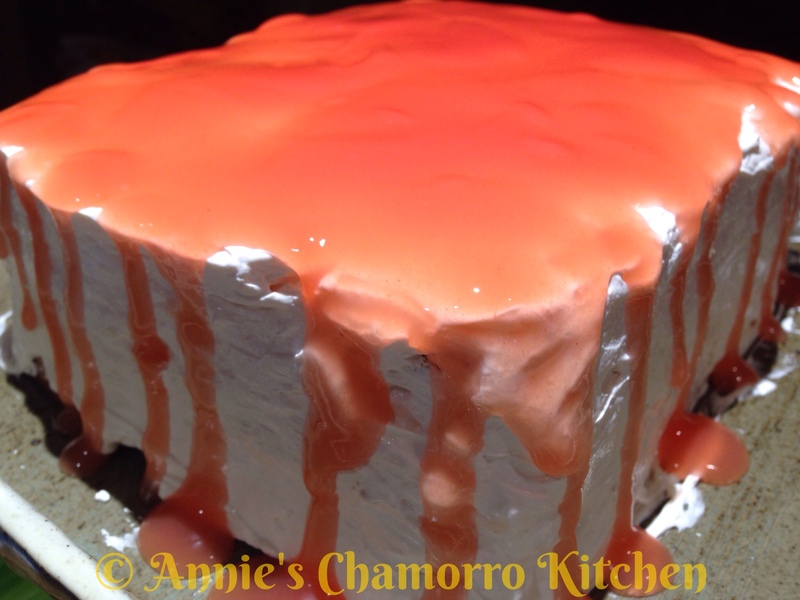 I’m happy to hear that my guava cake recipe is a huge hit with your family and friends. Dear Auntie Annie. Your guava cake recipe was devoured again this morning! My husband and daughter love mangoes, so I’m thinking of converting recipe to easy mango cake. I’ll let you know if it works out. Once again, thanks for your delicious recipe!!! Mango cake sounds divine! Let me know how it turns out. What size baking pan would I need? Use two 9×9 square pans or 9-inch round pans. Can I use the same recipe without cutting the cake in half? You can try using guava gel or paste, or guava jam. You can find these in Hispanic or Asian stores. Or, if you can find it in your grocery store, use guava juice, but do not dilute it. For Cher – I have found GOYA brand frozen guava juice concentrate at Kroger, and also in Asian markets. If there’s none by the frozen juice concentrates, try looking by the Hispanic frozen section. I just baked one today. I only have the guava nectar juice (not frozen). It came out good. I also used the Duncan Hines pink velvet mix. It’s yummy. My Bible study group devoured them. I want to try it with the strawberry mix next. Can fresh guavas be used instead of the ones you used? I haven’t used fresh guavas in this recipe so I don’t know for sure. I would imagine that it could work; you would have to cook the fruit down or puree it in a processor until you get a thickened mixture, much like the guava paste or puree. The best recipe ever! Thank you for sharing! can you do this with using a bunt pan? Most likely, but I’m sure you’d have to bake the cake longer. How long do you bake the cupcakes? Bake cupcakes between 15-20 minutes or until a toothpick inserted in the middle comes out clean. 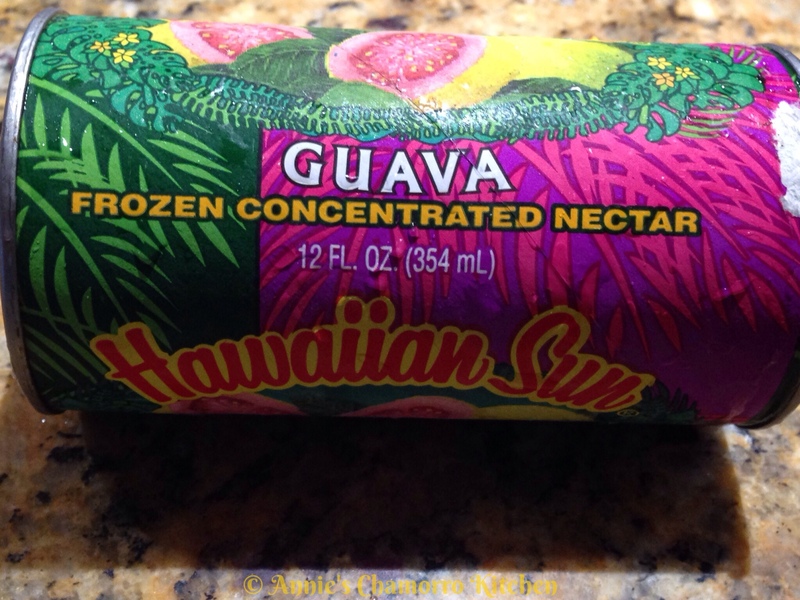 Can I use guava nectar bought from the store, I can’t find frozen guava concentrate. Yes, you can use guava nectar instead, but do not dilute it with water. Hi Gloria! 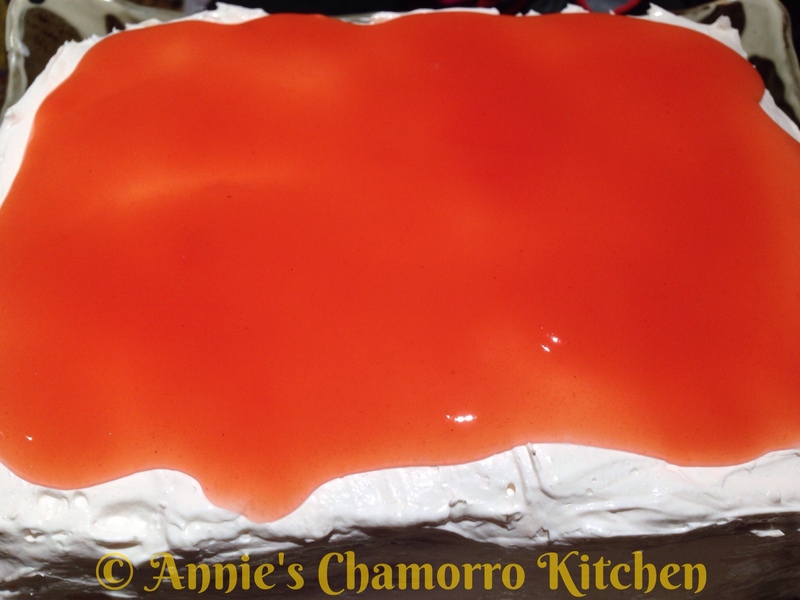 I wanted to find out how the cake turned out using Guava Nectar, instead of the frozen concentrate. I’m in an area where there is ONLY Guava Nectar available, and I am unable to find Guava Juice. Please let me know? 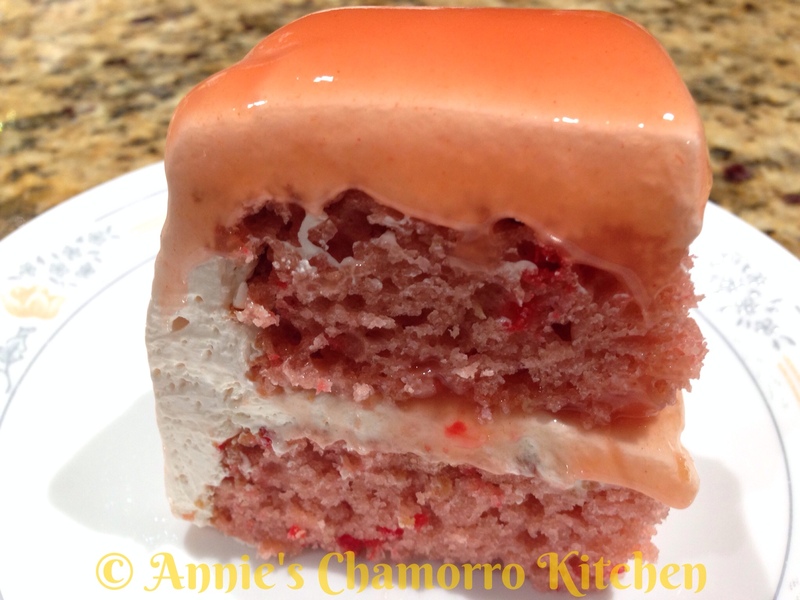 I’m craving Guava cake, and hope I can cure that craving soon!! Thank you so much! I just made it with the canned guava nectar and it turned out fine. I did add just a touch of red food coloring to the glaze. Love this cake! I made it, Thanks for the recipe. It is heaven in a bite! Omg, I’ve gotta try to bake this! Looks crazy delish….geeze. can’t wait to give it a try. Yum! I’ve made this a few times, it’s really good! Hawaiians love this cake we also use frozen lilikoi aka passion fruit in place of guava concentrate. Yum! Passion fruit would be so delicious with this recipe. Thanks for sharing! Hafa Annie! Oh thank you for this recipe. I have made it several times. I use real whip cream instead of cool whip and Guava juice that i found at the local Farmers Market. This cake brings bake the good memories of Hawaii and Guam. I think the next one I make I will use passion fruit juice. Thanks again. Hafa Adai, Karen! Thanks for giving my recipe a try. Let me know how it turns out with passion fruit. Update … I ended up cooking the frozen pulp (Goya brand) down very thick — amost like applesauce and used it in place of the oil and it was very, very good. The cake texture was perfect, nice and light–not too dense or heavy. I’m sure its not as good as the original recipe, but its a good substitute! Thanks for the update, Kathy! I’m sure it will be very helpful for anyone using guava pulp as a substitute. Very delicious dessert…Already make it. soo yummy! I just wanted to share that I made this cake for a friend’s baby shower knowing she loves guava cake and it exploded from there. It has been a big hit and everyone absolutely loves it. Thank you for sharing and bringing the islands closer to home. Thanks for the update, and I’m so glad that everyone loves it! how many servings for this recipe? That depends on how big you slice each piece. You can get at least 12 servings. Thank you sooooo much for the recipe, I’ve been asking my Hawaiian friends for their recipe but they didn’t want to share. I am definitely making one for Christmas :). I can already taste it <3 ! You’re welcome! Let me know how it turns out. Merry Christmas! 2 small rectangular pans? What size? Your fotos really make your site come alive! Mahalo!!! Sorry my directions weren’t clear! I used two 8×10 pans here. 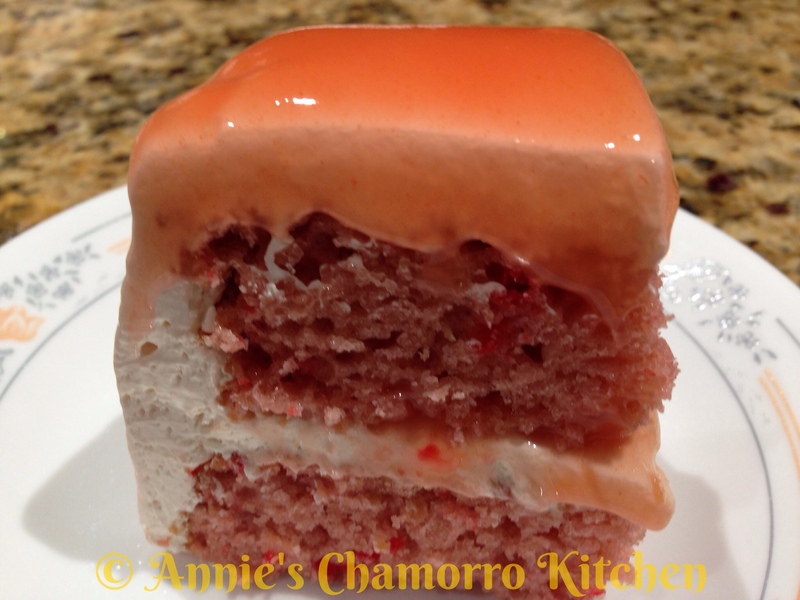 Annie, just wondering, would a vanilla cake mix instead of a strawberry cake mix, hinder the guava flavor? 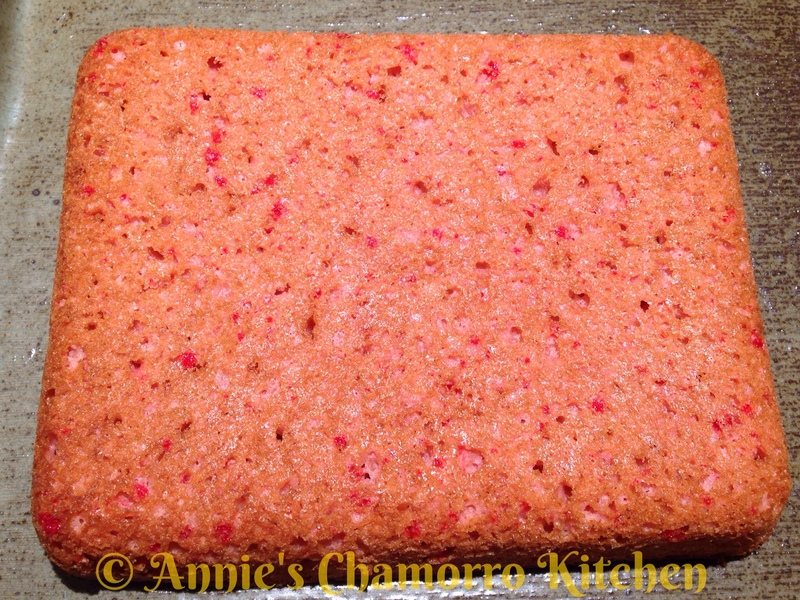 I’ve yet to try this cake with the strawberry cake mix; did the strawberry flavor overpower the intended guava taste? I’ve never tried making this with a vanilla cake mix, but I don’t see why it wouldn’t taste good using it. The strawberry flavor was not overpowering at all. Thanks Annie; I’ll try with the strawberry cake mix and do a passion fruit icing. I really want to try this. I hope that I can find the guava concentrate in Chicago. I like the paste even better. Back in the day, in Tacoma, we would ask people coming from Hawaii to bring us a guava cake on the plane. Frankie, you’ll like this one. It’s super simple to make. Let me know how it turns out for you. Hafa Adai and Talofa! I’m so glad you like my recipe(s)! 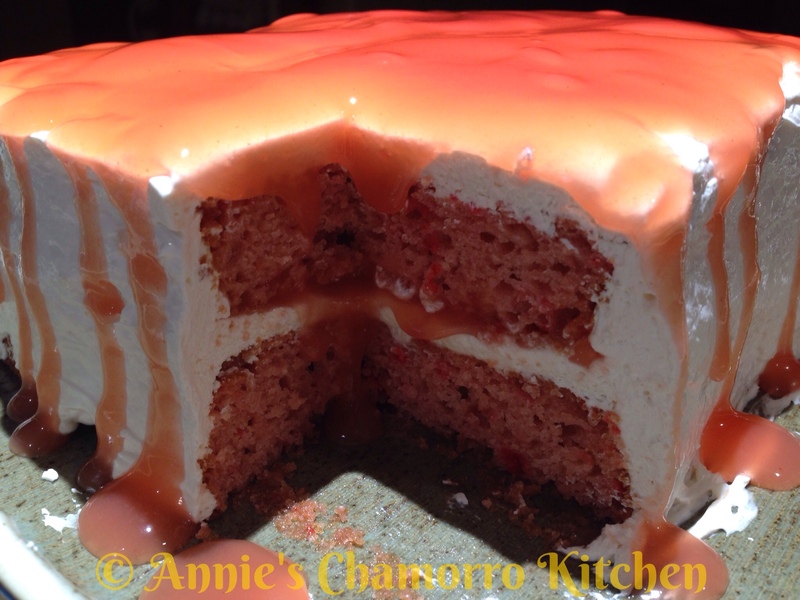 It would be great if you could share photos of your guava cake the next time you make it. I’d love to see it. Take care! I have made this and it is a real hit with the familia!!! Thanks for sharing. I have tried some of your other recipes and they are all delicious!!! Hafa Adai, Mary! Thank you for giving my recipes a try, and I’m glad you like them! No stores here carry Guava Concentrate. I’m wondering if reducing Goya Guava Paste would work? I’d really like to give this recipe a try. 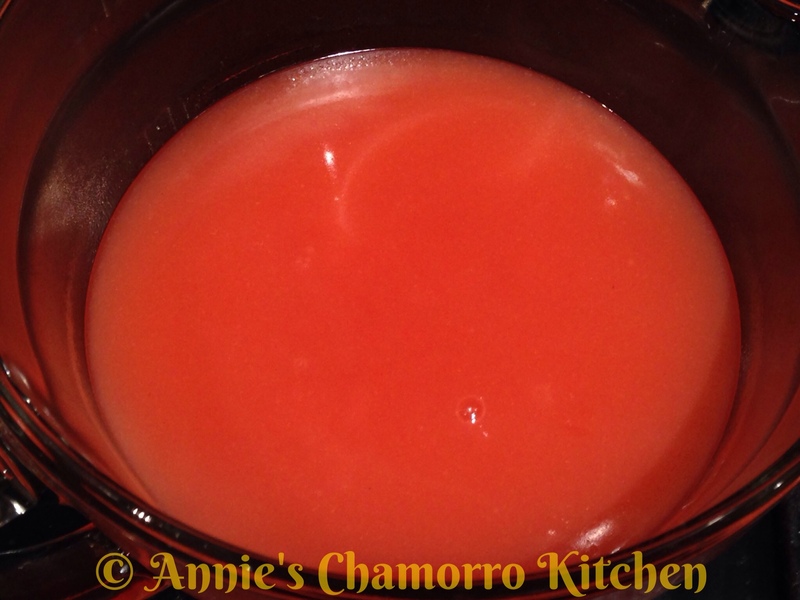 You can easily substitute guava paste for the concentrated juice. Cut the paste into small cubes and put it on a pot over low heat. 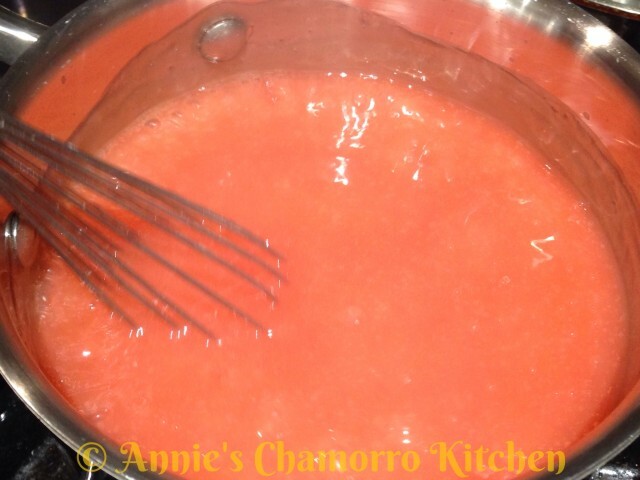 Gradually add 2 cups of water, stirring until the guava paste dissolves. Add sugar to taste if needed. After the paste completely dissolves, remove it from the heat and set aside to cool down. 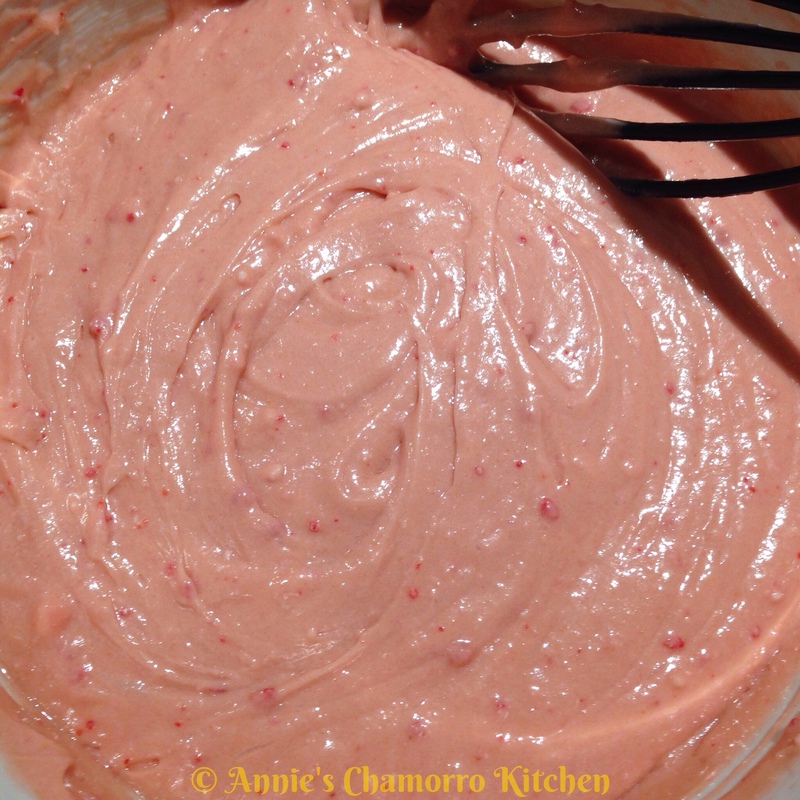 You should now have enough guava liquid for the cake and guava sauce. 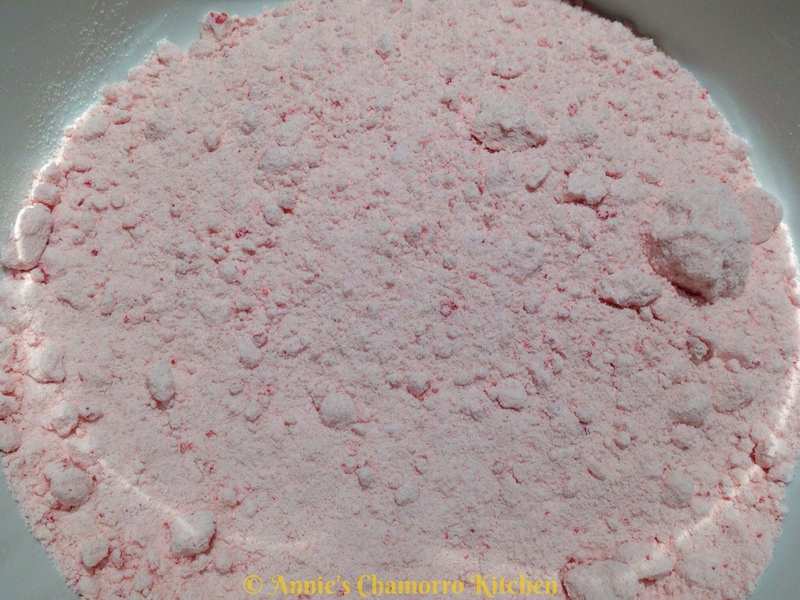 What about using frozen guava pulp? It’s the only thing I can find in the Kansas City area. The canned (not frozen concentrate) nectar we have here is not pink– and it really doesn’t have much of the good guava flavor. Thanks! You could try the pulp…if it’s too “pulpy,” strain the diluted mixture through a fine mesh strainer. Thank you– I’ll try that! its a definite gotta try out here in Alaska. You’ll need about 4 or 5 medium pink guavas (or enough to fill up a blender after peeling and dicing them), 1/2 cup sugar, and 3 cups water. Cut the ends off the the guavas and peel the outer skin. 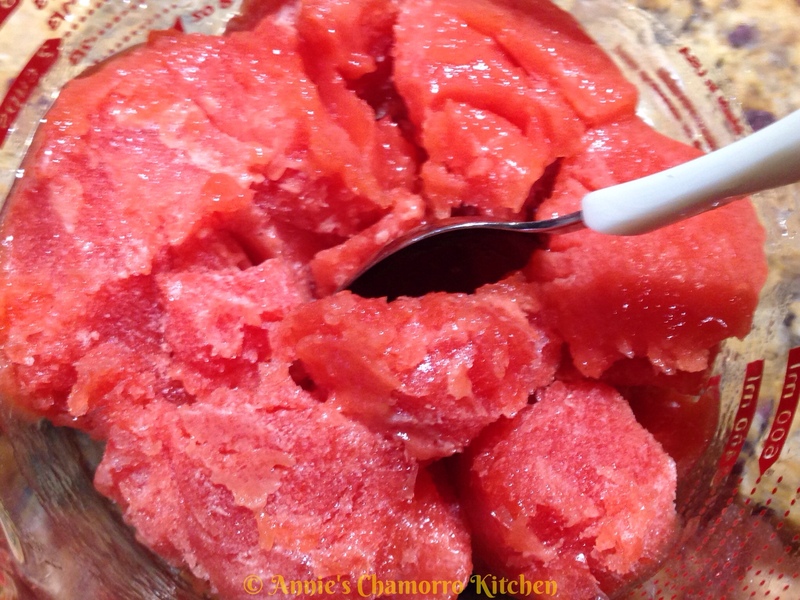 Chop the guavas into cubes and place into a blender. Add sugar and water, then blend until smooth. Pour the mixture through a fine sieve/strainer to remove any seeds. Taste for sweetness (add more sugar to your liking). The juice should be relatively sweet. Use the juice as directed in my recipe. Haven’t had DeeLight Bakery’s guava cakes in forever, this may hit the spot. Now if I can hope and pray the Asian markets here in Orlando, FL have guava concentrate! Monica, I think you’ll be happy with my version. Give it a try and let me know what you think. If your local Asian market doesn’t carry guava juice concentrate, look in the Hispanic markets. Can you use guava jam? I’m sure you could use guava jam instead, but I would still dilute the jam (heat it up and mix it with some water) for the cake. 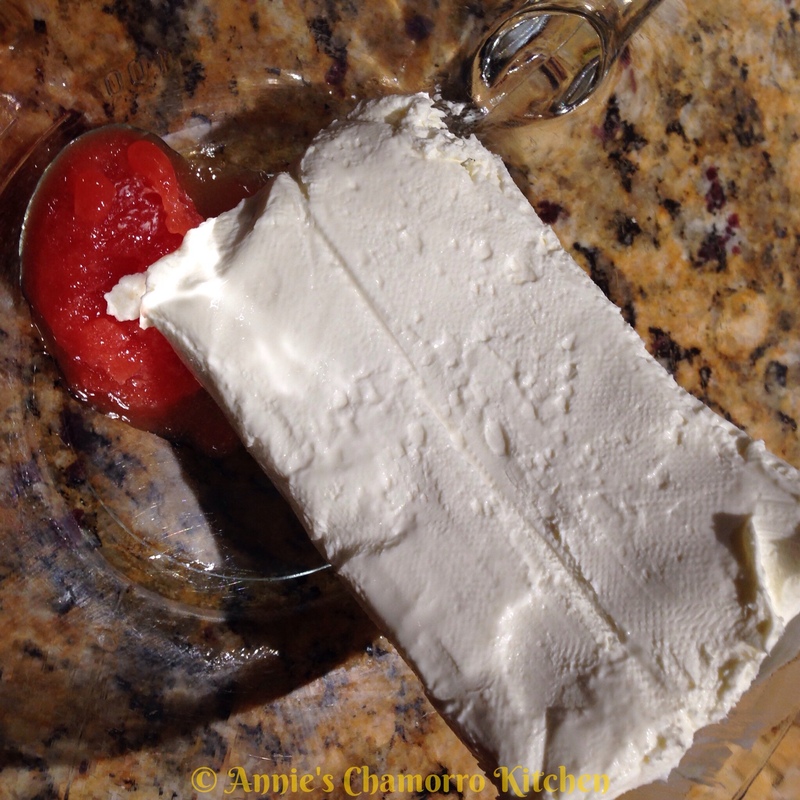 You can use the un-diluted jam to make the whipped cream topping and guava sauce. Give it a try and let me know how it turns out with jam. Send me photos of your cake when you make it.